National Audubon Society Field Guide to New England, by Peter Alden and Brian Cassie, 1998. If you want just one nature guide for the entire region, this amazingly comprehensive yet compact book is our pick. Covers 1000 species of flora and fauna with beautiful color photos. Trees, shrubs, flowers, mushrooms, ferns, birds, mammals, reptiles, amphibians, fishes, insects, star charts - this guide has it all! 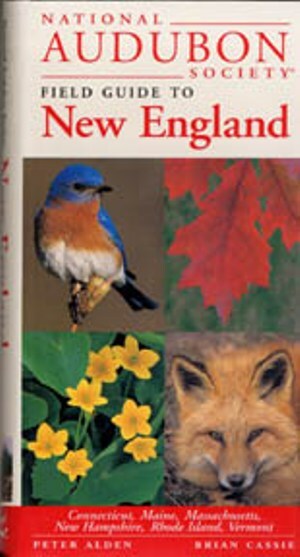 The authors even find room for habitat descriptions, geology info and a listing of parks & preserves across New England. Over 1,300 photos, 150 drawings, 20 maps. 448 pp, 4” x 7 ¾”.